Authors, entrepreneurs or those just looking for an additional revenue stream can come to the “boot camp” at the Courtyard Livonia, 17200 N Laurel Park Drive in Livonia, Michigan near Laurel Park Mall. “Because we get calls all the time from people who want to learn how we do what we do, we wanted to share our resources, experiences and give them an up-close and personal event to show what we do behind the scenes. Our mission is to help people crack the internet code,” said Perry. The Tech CPR Boot Camp is basic training for people who are comfortable with the internet but find it hard to really leverage it to make money online, brand themselves and keep up with all the new social media tools. “If you can log on, browse, click, drag and drop online, we can help you get to the next level,” said Claxton. •	How to master every technique needed to become an advanced internet marketing money-making machine. •	All the tricks, tips, and secret techniques used to easily navigate the internet like a pro. •	How to use Social Networking to earn a hefty income with popular sites such as Twitter and Facebook. •	How to build a stable online business just by following along with a few video tutorials. This Boot Camp is different from others because people will get personal attention that will cater to those from beginner to the advanced level. “Without all the techno-speak,” added Perry. Added Claxton, “the last event we did in Farmington Hills, people walked away feeling empowered. They had their ‘aha’ moments – and we still get tons of testimonials,” said Claxton. If you want to join thousands of internet entrepreneurs and skyrocket your profits online by mastering the most popular Social Networking sites like Facebook, Linkedin and Twitter, then this is by far the most important letter you’ll ever read. You’ve probably noticed the world is quickly changing from the industrial to the technical industry. This means people are moving from manufacturing work, which was popular throughout 1990’s, to the ever-growing world of the internet. Why? Because the internet is the largest market place in the world, with billions of buyers and sellers all coming together to exchange goods and services for cold-hard cash. And, if you’re not capitalizing on the internet… you will be left behind! How Much Money Can Be Made Online? Well, let's just say the opportunities are… unlimited. The reason why the ability to grow your business online is so profitable is because the only thing an online business owner has to do is place their products or services in areas where your most targeted network of customers hang out. And, when you constantly market to a group of targeted buyers, your profits will start rolling in like… clockwork! Where Do Targeted Buyers Hang Out? People interested in what you’ve got to offer search the search engines ones like Google, Bing, Yahoo in addition to you can usually find them on Social Networking sites. In the online world, Social Networking is the way users build online networks of contacts and interact with these personal or business friends in a secured environment. Some of the most popular Social Networking sites include Facebook, Linkedin, Twitter and MySpace. The secret behind making Social Networking a beneficial source for any business is to become proficient at the technical side of how these platforms work, so you can build the MOST business connections in the LEAST amount of time. And, when you establish a nice list, you’ll be able to promote to them like crazy. When we tell people about the unlimited possibilities available on from using Social Networking sites, to grow a business their eyes grow wide. What we also noticed was that their confidence soon faltered. The main reason is because people don't have a clue as to how to make the Social Networking sites work for them. In order to grow your online and offline business you need to have a presence in the Social Networking world. That’s why we at Tech Club CPR have come together to help individuals, just like you, with dreams of finding financial freedom via the internet. To get to know us better, here’s a small intro on all the instructors of the program. Charles currently practices in the Hershey, Harrisburg and Central PA areas as an internet consultant. He’s also been a trained Online College Professor since 1994, winning an innovative teaching award. Currently, Charles is an internet marketer and owns a marketing consultant firm. So, the idea of being involved in a team that helps others grow and reach their online endeavors has always been a priority for him. Pam Perry is best known as the “PR Guru” and “Marketing Whiz” by the national media such as Detroit Free Press and Publishers Weekly. Perry has arguably been one of the more high-powered and visible figures in public relations. Her career serves as a notable example of the potency that personally handled promotion has acquired in the mass media. Perry’s rise in the wrangling world of publicity began when she worked in public relations and advertising. Learning the business from the inside out, Perry became a PR agent and eventually formed her own firm, BART (Blacks in Advertising, Radio & Television), a nonprofit networking organization for African Americans in the media. Although partners came and went over the course of two decades, Perry remained a constant. Earning her clout in the industry, Perry has been instrumental in assembling a clientele list: clients over the years have included McDonald's, Ford Motors, Joy of Jesus and The Salvation Army to name a few. 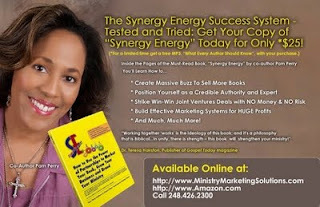 Currently, she does public relations for the publishing industry and is a PR Coach for self-published Christian authors. Perry has placed clients on media such as TBN, Daystar, Harvest Show, The Tom Joyner Morning Show, The Steve Harvey Show, Essence, Ebony, Black Enterprise, Jet and countless others. Her work has also appeared in Gospel Today magazine, The Detroit News, The Detroit Free Press, CBA Marketplace Magazine, Precious Times Magazine, Michigan Front Page and The Christian Communicator. Perry’s greatest attention is devoted to her clients, who value her for exalting their talents. This management style has enabled Perry to carve a niche for herself amidst the morass of media marketing. As a real estate investor, Ralph started his own empire that made a huge transition to the internet world where Ralph became a coach. He saw that many of the programs out there lacked the ability to show people the technical side of how to make money online. After making this discovery, Ralph dug deeper and created a product that taught online business strategies from the beginning, using technical skills and teaching his students profitable, inside techniques, in simple, laymen terms. When he started out in internet marketing, Ralph discovered his own problems. This is what sparked Ralph’s passion to coach and share with the world, through the internet. "He's often said "the internet has evened the playing field when it comes to making that making money". Tech Club CPR Boot camp is a seminar that show you how to implement the technical side of Social Networking in order to get an “edge” over other internet marketer's. You’ll discover important backend strategies absent in other programs. By knowing these strategies, you’ll be shown, hands-on, where to play and how to play the game of Social Networking. · Learn how to use your personal computer and the full power of the internet to generate multiple streams of income! · Exploit social networking sites such as Twitter, Facebook, Blackplanet, Digg, and more! · Use YouTube, Google, Ning and other sources to increase traffic to your blogs or affiliate links! · Utilize CPA networks, Clickbank, Commission-Junction and E-Junkie to maximum effect! You’ll get first-hand experience on how well our seminar will cater to you no matter what your background or computer knowledge, from beginner to the advanced level. Best of all, our seminars specialize in showing YOU these valuable resources without all the techno-speak commonly found in other courses. Just listen to what a few of our previous seminar attendants have said. go to www.techclubcpr.com To Order Now! Listen, if you can turn on a computer, the Tech Club CPR Bootcamp can easily teach you the rest! Save Your Exclusive Spot To Learn From The Most Successful Internet Entrepreneurs in Social Networking! When you add it all up, you’ve got 3 of the most successful internet entrepreneurs willing to expose to you all their secret tips, techniques and strategies so you can have a financial advantage over the rest during these hectic economic times. Listen, you’ve seen what other people are saying about our programs. In a nutshell, they’re saying our seminar is like going to a 12 hour seminar with the most affluent money-making coaches around the world - and you’re the only attendee! You should know, a regular seminar hosting with this kind of caliber of social media experts would easily cost up to $3,000 per seat. And that’s in the nose bleed section. But, we’re happily giving you an opportunity to grab a seat at the Tech Club CPR Boot Camp for only $397. The reason why our price is so low is because our passion is to help other business owners grow and succeed. And, when you become a success, we are a success. But, before moving forward and passing this information to your friends, we must stress that this offer is limited to only 25 seats. We like small sessions because it gives you a more “personal” training feel. So, unfortunately, after the 25th’seat is taken, this offer will close. But, for the first 25 people to sign up, you’ll get your own VIP seats, where there’ll be no interruptions - just you and the speaker lineup. So, when you compare the price of $397 to any other way imaginable to hear these amazing internet wealth experts speak, you’ll see the price we’re asking you is…pennies. Now, I’m sure you can be one of the lucky 25 to jumpstart your business, so you never have to worry about money ever again. To join our Bootcamp, all you have to do is click on the order now link below. Information about the Bootcamp will then be sent to your email. Listen to few more of our previous mini boot camp attendants. You must hurry and take action because there are now only 17 seats left. You see, we made the mistake of promoting this seminar much sooner than we were able to complete everything. So, we had people lined up to order. Our phone was ringing off the hook for weeks, so we went ahead and let a few people preorder, but we weren’t prepared for such a huge turn out. We are trying to hold on to spots for people who order through this sales letter. The reason why we didn’t make more seats available is because we wanted the presentation to be exclusive to only those serious about making big leaps in their online business. Why only serious business owners and entrepreneurs? Because, in this terrible economic state, they’re the ones who know that they need all the valuable information they can get to ensure their business continues to thrive and take action when something of value comes along. So, I’m sure you won’t hesitate to take us up on such an incredibly low, once-in-a-lifetime offer. After thinking about the economy and how many people it’s affecting, we’ve talked about it and decided to offer an early bird special for those who are serious about learning powerful information that will help their business grow - NOW! So, for the next two weeks, you can get into the boot camp for ONLY $197! Yes, we know, this is a crazy deal. But, you must know that on the 15th day, at 12:01am, the price will go up to $297 until a week before the boot camp starts. Then, $397 for those who choose to procrastinate. To get your spot at the Tech Club CPR Bootcamp and take advantage of our early bird special, just click on the box below. Yes! I’m ready to receive my VIP seats to hear the Tech Club CPR Bootcamp while supplies last and make serious money for my internet business for years and years to come! I understand that there are only 25, 20, 17 seats left at the early bird price of $197 for only 2 weeks. And after those 2 weeks end, the price will continue to rise. I also understand that when all the seats are gone, there will NEVER be another chance for me to get these proven, secret tactics again! Now, I’m ready to learn from the best on how to take my online business to levels beyond belief! P.S. I can't stress enough how powerful this seminar is. That’s why spots are leaving fast. I just checked and there are now only 14 spots available. So, if you’re ready to take your business to unimaginable heights using the most popular Social Networks available, you’d better act now! Click Here To Order Now! P.P.S. Remember, placing your order within the next 14 days, gets you in at the early bird special of $200 OFF the regular price. This is one time you don’t want to procrastinate. Book Marketing Simplified - PR Tips on how to GET OUT THERE! Since my conversations with these writers were brief I kept the tips as simple as possible, but then it occurred to me: this was exactly how I was planning the marketing of my newest book. I'm purposely keeping it simple so I don't get overwhelmed. And overwhelm is common. After all, according to John Kremer there are 1,001 ways to market your book. You can't possibly do them all! So here's the easy way to look at book marketing. Make good choices and you'll find just the audience you're looking for. Guest blogger: Sophfronia Scott is Executive Editor of the Done For You Writing & Publishing Company. Learn what a difference being a published author can make for your business. Get your FREE audio CD, "How to Succeed in Business By Becoming a Bestselling Author" and your FREE online writing and book publishing tips at www.DoneForYouWriting.com. Want to be guest blogger for this blog too? Rich writers understand that writing a book is only the beginning, not an end in itself. They are often marketers first and writers second. Marketing may sound like a dirty word especially to literary or academic writers. I understand that. I used to feel the same. But let me ask you this. What's the point writing a book if you can't sell the darn thing? If you really want to make a successful career as a writer, you can't afford to ignore marketing. What I recommend - if you haven't done it already - is to think about 'joint ventures' to sell or promote your book. Don't be put off by the business jargon - this just means looking for other people who can help sell and publicize your book for you. So, for example, if you've written a book about childcare, are there any professionals who could promote you to their list of clients? If you've written a book about dogs, are there online vets or dog schools who could promote your book to their customers? Why would they do it, you might ask? Simple. If your book aligns with their service, they are adding value to their clients by telling them about you. Now listen up - some businesses have 'lists' running into hundreds of thousands, sometimes millions. Most mainstream publishers on the other hand are happy if they sell five thousand books - this is considered a 'successful' print run! Do it today. Right now. Write a list of 50 potential joint venture partners. Feeling nervous or a little intimidated? Yes, we all do. Even with 20 years experience, I still get butterflies at times. But if your goals aren't making you even a little scared, you're probably not setting yourself big enough goals! Breaking through that 'fear barrier' is what separates out bestselling authors and millionaire writers from the rest. Even if 40 business owners say 'no', and 10 say 'yes' this could make a massive difference to your book sales. Is this book your passion? Does it make your heart sing? If so, can you afford not to take this step today. Try it - what have you got to lose? Stephanie J Hale is a leading writers' coach and publishing scout. She's worked with bestselling authors and top literary agents for over 20 years. She specializes in helping writers get the publishing deal and readership they deserve.